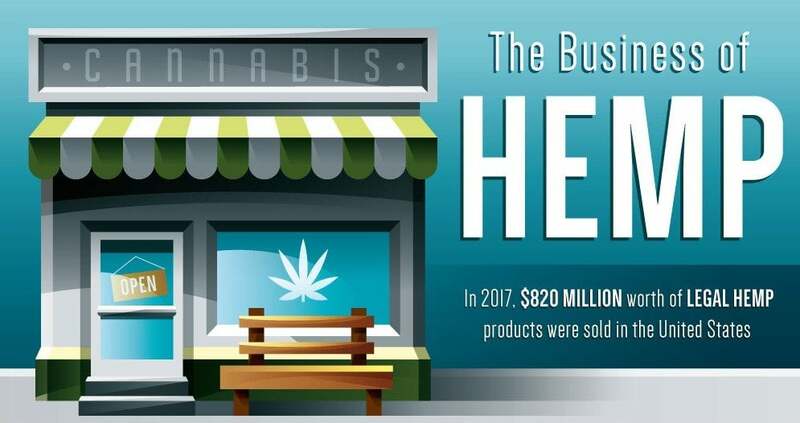 In 2017, over $800 million worth of legal hemp products were sold in the US and by 2021, legal hemp and cannabis will be a $40 billion domestic industry. Though fraught with over a hundred years worth of legal issues and government roadblocks, the uses and environmental impacts of hemp are no longer being ignored. Today, hemp farms are present in 19 states and cover an area of 25,713 acres. Over 1,400 licensed were issued by the US government to individuals to grow hemp and 32 US universities conducted hemp-related research. From textiles to medicinal supplements, hemp has unique properties and dozens of uses for nearly every industry. CBD, the non-psychoactive property present in marijuana and not to be confused with THC, is a common compound derived from hemp the uses of which seem endless. With numerous health benefits, CBD has been shown to reduce symptoms of chronic pain, nausea, anxiety, and even discomfort associated with cancer treatments. Hemp seeds offer a source of complete protein, healthy fats, and vitamin E. The soluble and insoluble fiber content aids in digestion, the fatty acids improve skin conditions such as acne and eczema and the arginine and GLA content within may help reduce the risk of heart disease. Legal challenges still exist, some dating back to the 19th century, but slowly these confusing and needless statues are being reviewed and overturned. This isn’t the first time that the laws prohibiting the use and cultivation of hemp have been revisited however. Back during the second World War a program called “Hemp for Victory” encouraged farmers to grow and supply hemp rope, parachutes and other necessary textiles for the war effort. Long-term prohibition has made it incredibly difficult to find viable growing seeds and even when they are available the THC content may make them illegal to be in possession of. Furthermore, as a “controlled substance” seeds cannot legally cross state lines. As these issues are revised, more and more small businesses are stepping up to work with hemp products in an effort to make hemp production legal, cost-effective, and available to everyone. Though still legally defined as a narcotic, hemp growers face seemingly endless legal roadblocks, but times are changing and viable solutions are being applied to these antiquated laws. Take a look at this infographic for more on the state of legal hemp production in the US, what it could mean for the future of the environment, textile production, the medical industry, and even business.